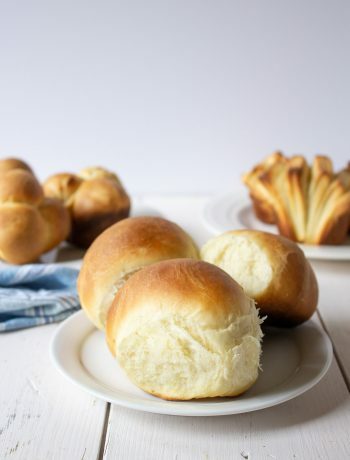 Are you ready for a fun, easy, kid-friendly treat to make? 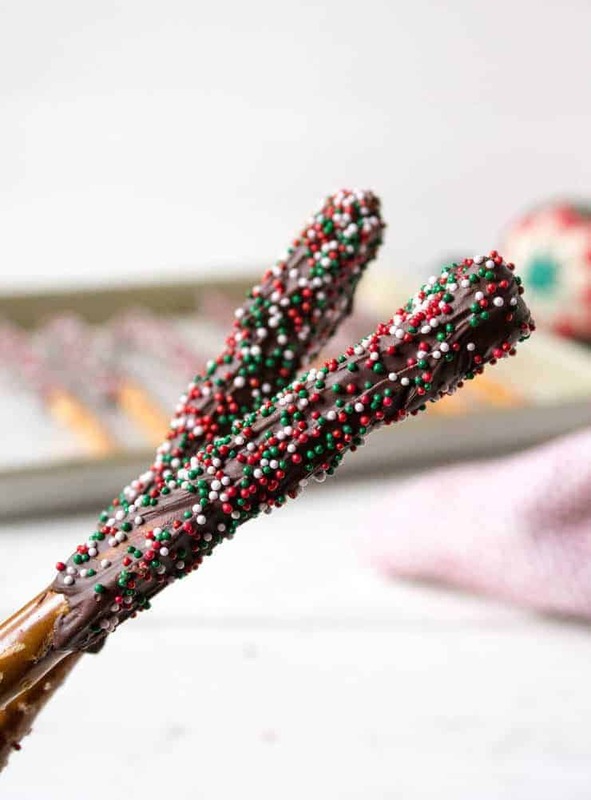 Chocolate dipped pretzels are so festive and so easy. And chocolate and pretzels are a wonderful sweet/salty combination. My kids jumped right in to help me make this festive treat. We had a lot of fun….although I will admit, there were a lot of colored sprinkles all over the kitchen…and the rest of the house… by the time we were done! We used milk chocolate, chocolate chips. 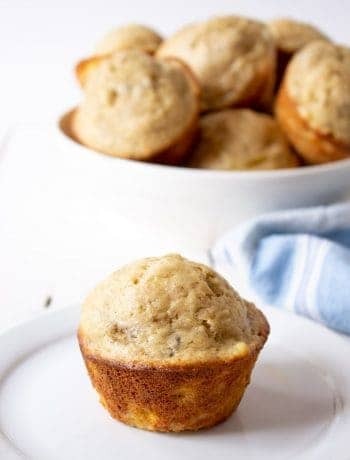 They are easy to melt and don’t require any special techniques. We used a microwave for the melting. You do need to be a bit careful so you don’t burn the chocolate. I like to heat for 30 seconds at a time and then stir and heat again until the chocolate is completely melted. Then you just dip your pretzels. 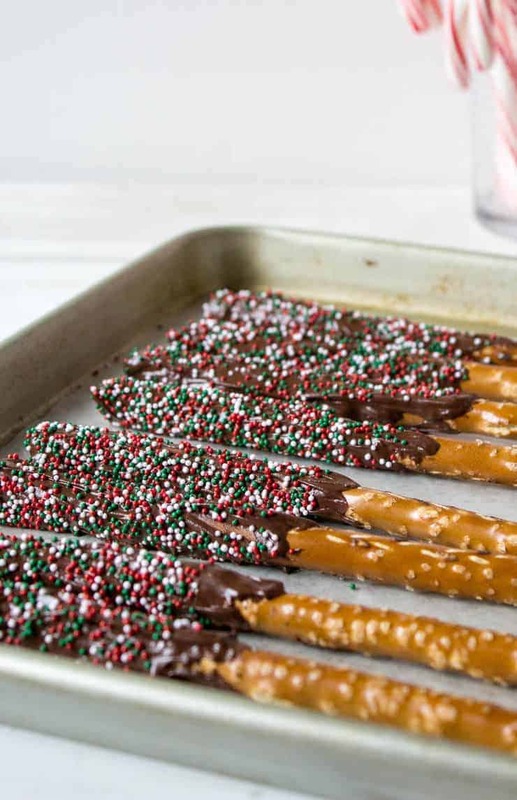 Well, actually, we found spreading the chocolate on the pretzels worked better than an actual dipping. Dipping was too uneven and yielded way too much chocolate on each pretzel! Sprinkle on the sprinkles! 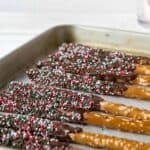 Set the finished pretzels on a baking sheet lined with waxed paper. There was lots of finger licking going on here…luckily this treat was just for our family! 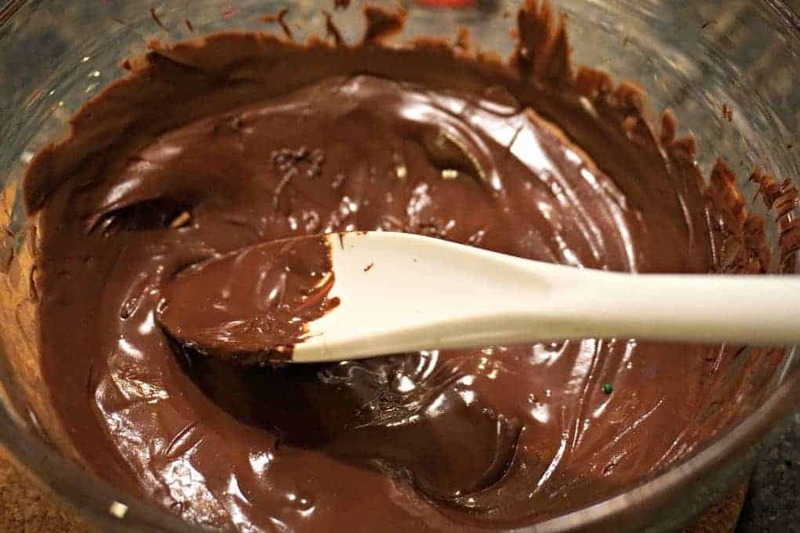 Melt the chocolate in a microwave safe bowl. Heat for 30 seconds at a time, stirring between each time. Continue heating for 30 seconds at a time until completely melted. 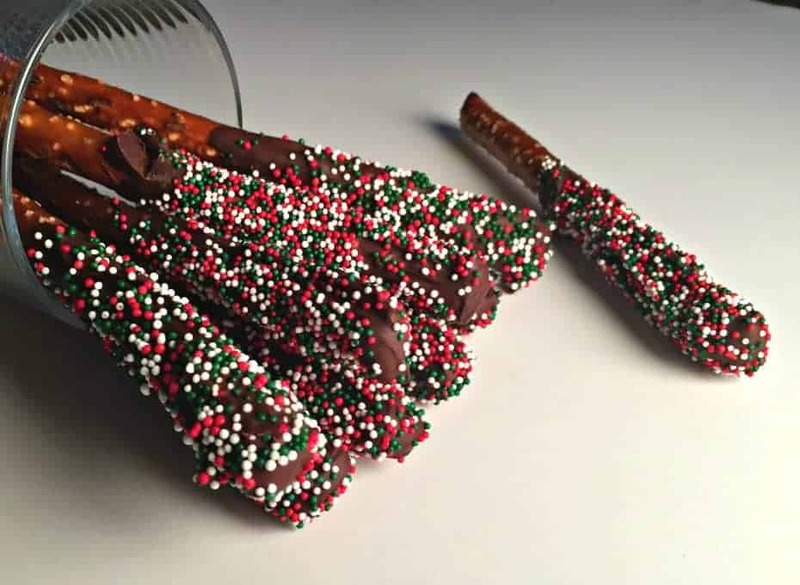 Spread chocolate on 1/3 of each pretzel rod. Place on a baking sheet lined with waxed paper until cooled and chocolate is set. Last time I made my chocolate turtles I had leftover chocolate and I decided to dip pretzels into it. Yours look so festive and fun for the season- I love them! 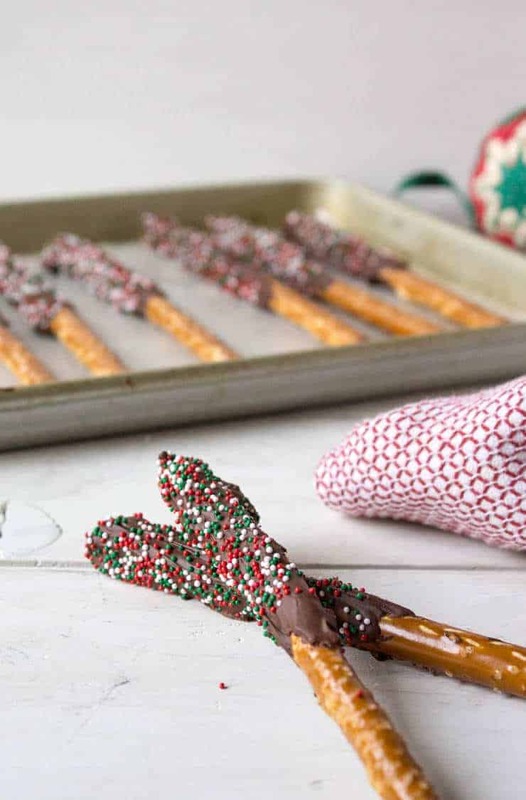 These are always so a fun and festive treat to make with kids, Kathy. 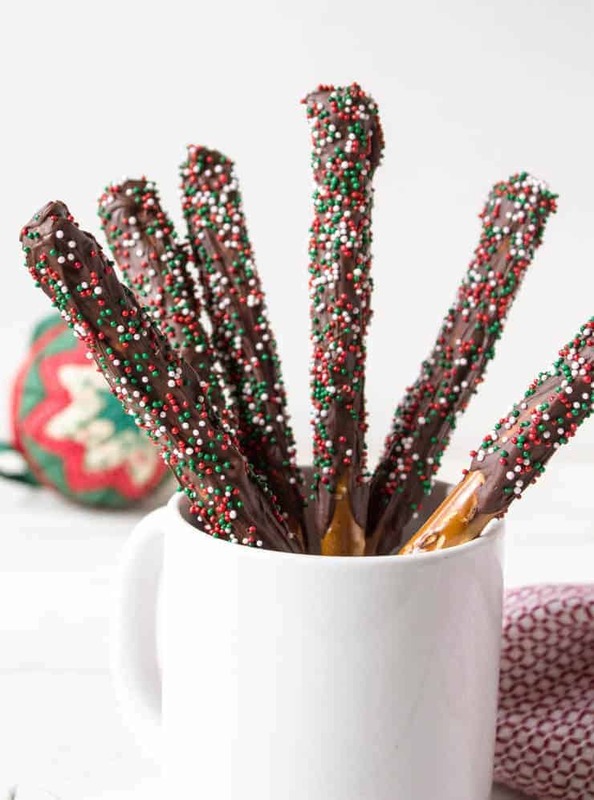 Chocolate and salty pretzels – what’s not to love! 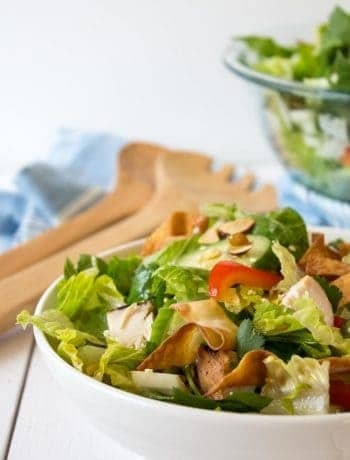 Sometimes we need something quick, easy and delicious! That would make one happy Santa! These are adorable, festive and fun, and need to be included in all my daughter’s teacher gifts this year! There’s only one problem….who gets to lick the chocolate bowl? Hmmmm??? Who gets to lick the bowl is always a dilemma! 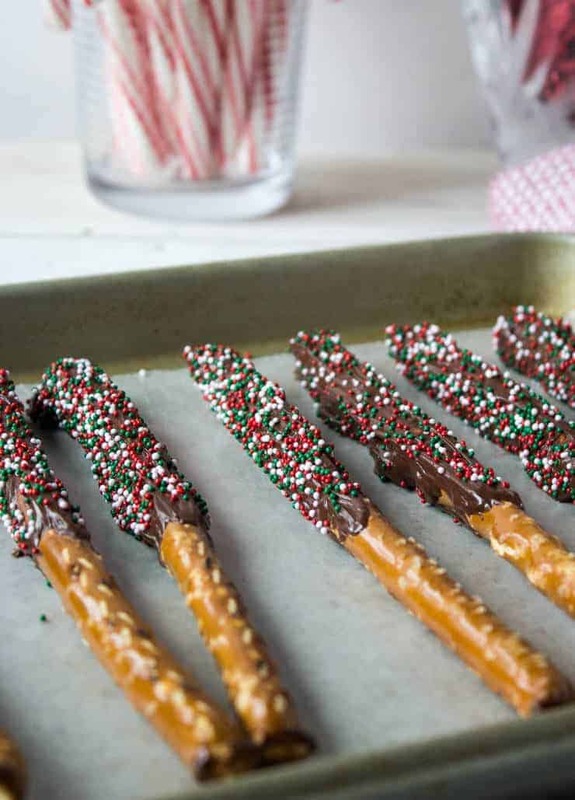 Chocolate covered sprinkled pretzels! Yes! I love this! I can only imagine cleaning up all those sprinkles from your house with kids helping! Happy Holidays! 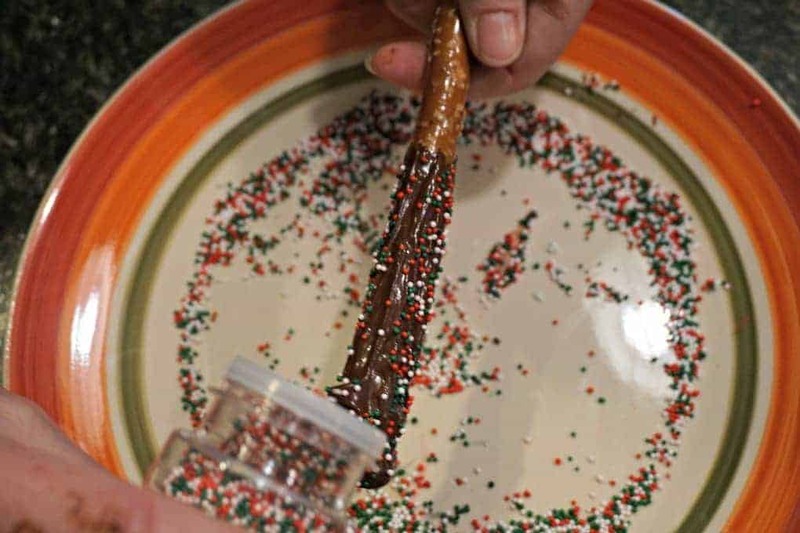 Very festive with those sprinkles and how fun doing it with the kids! Kids of any age can help with these!